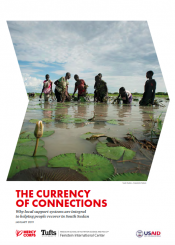 The purpose of this report is to give aid actors insights into localized social protection and support systems in South Sudan and the ways in which humanitarian aid, including cash transfer programming, can both complement and disrupt these systems. In protracted crises in which formal governance structures are weak to nonexistent, people depend heavily on local systems—both social and economic—to get by, often more than they depend on external aid. Households and economic actors may rely on their friends, neighbors and extended families for food, access to economic opportunities, and negotiation of safe passage when fleeing from conflict. In addition to social support networks, markets have been shown to play a critical role in enabling crisis-affected populations to cope with and recover from conflict, displacement and disasters. This report describes variations in households’ social connectedness and their related abilities to benefit from local support systems. Additionally, it considers the different obligations that households and economic actors have to support others in their communities and whether such support is reciprocal. Findings are based on 67 qualitative semi-structured interviews conducted in October 2018 in Panyijar County (southern Unity State). Respondents included a diverse sample of households, economic actors and key informants. The project is carried out in a partnership between Mercy Corps and Feinstein International Center. This report is made possible by the support of the American People through the United States Agency for International Development (USAID), with support from the Office of Foreign Disaster Assistance. The views expressed in this report do not necessarily reflect the views of USAID or the United States Government. This report synthesizes findings on livelihoods from research projects that took place over five years in eight countries affected by fragility and conflict as part of the Secure Livelihoods Research Consortium (SLRC).